If you’d like to know how simple our roulette system is to use, see the new roulette system video at this link. It includes some screenshots of our software and explains the basic steps involved. Beating roulette requires extremely sophisticated analysis, which would normally be too difficult without the help of software. Over the years, we have developed our roulette strategy software so it is easier to use. After all, what’s the point if it’s too difficult? It is now at the point where anyone can learn how to use it, and anyone can achieve the same results as an experience player within minutes. Even if you’ve never played roulette before (although its of course smarter to take your time and play practise sessions before betting for real). In addition to what is explained in the video, there are of course a few other procedures you need to follow but they are by no means difficult. Importantly, we are not claiming you can just walk up to any wheel and instantly win millions. Our system does not beat every wheel. Specifically it beats approximately 30% of wheels, which is more than enough considering a single wheel can earn tens of thousands before the casino staff notice you. Ultimately we have made sophisticated and complex techniques now very easy to use. Explaining how the system works is not a simple task. The actual application of the system may be relatively easy, but the underlying principles are quite sophisticated, while at the same time the physics is quite simple. However I’ll explain the basics. Firstly you must understand that roulette is all about a physical roulette wheel and ball, and it has nothing to do with the betting table. The betting table is simply a place to make bets, and it has absolutely no influence on where the ball will land. Despite this, almost every player bases there bets around the betting table. Many players may even bet on the number one, but the ball and is a number two, and they will automatically assume that because the roulette dealer places the marker on number two, but they were very close to winning. But on the European wheel, numbers one and two are almost completely opposite one another. So the first rule to understand is roulette is about a little wheel and ball. In fact the word roulette is French for little wheel. The second important thing to understand is that real physical variables determine where the ball will land. Some of these variables are predictable, and some are not. Of the variables that can be predicted, some have little influence on where the ball will land, and some have a major influence. If you consider the spin outcomes, and the variables you can predict, you are able to correlate them to predict future winning numbers. This is essentially what my system is about – real and commonsense physics. Calculating the physical variables of a roulette wheel and ball to predict outcomes is not a new thing. Professional players have been using physics to beat roulette for some time. It is a misconception that the application of physics is complicated, because for most roulette strategies involving physics, it is actually quite simple. For example consider roulette wheel bias analysis, which primarily considers how often winning numbers occur, and whether or not they occur more frequently than we expect if the outcomes were random. So basically if a winning number occurs more than what we would normally expect, over a statistically relevant amount spins, then we can consider the wheel is likely biased. This means that there is likely a physical defect that causes some winning numbers to occur more often than others. Making it even simpler, bet on whatever numbers occur most. Modern day bias analysis is quite more complicated though, because casinos use software to detect bias on their wheels. However, there are still ways to detect the bias that casino staff had missed, although this is beyond the scope of this article. But one example is you can visually determine physical defects of a roulette wheel in much less time than it takes to collect data required for analysis. You may have just noticed that a roulette wheel has been moved or replaced, and it would normally take thousands of spins to analyse a wheel for bias. But if you listen carefully when the ball falls, you may notice there is a different sound when the ball hits one area or another. This could be because a pocket separator has become loose, and this in turn takes the momentum out of the ball and makes the ball more likely to fall in certain areas of the wheel. So you can guess there is a bias without collecting thousands of spins. My roulette system does not require physical defects of a roulette wheel. The patterns exist on any wheel that’s either new or old. Inevitably in the long-term, visible patterns will occur. Looking at roulette simplistically, say if the dealer spun the wheel and the ball at the same speed every time. And it goes to say that it is logical that the ball will at least land in a specific area more often than it would if the spin speeds were completely random. Consistently spinning dealers does happen, and it’s called dealer signature. But the problem is dealers are regularly rotated, and you may not see the same dealer on the same wheel for weeks. And to make matters worse, gradually the physical properties of a roulette wheel will vary. This includes not just the surface of the ball track where the ball rolls, but also the air pressure and other physical variables that determine the ball’s deceleration rate. Roulette is indeed a very dynamic game with conditions constantly changing. Basically my roulette system models the static properties and resulting patterns of a roulette wheel, and develops a dynamic model to predict how the patterns will evolve as other variables change. But how simple is it to apply? 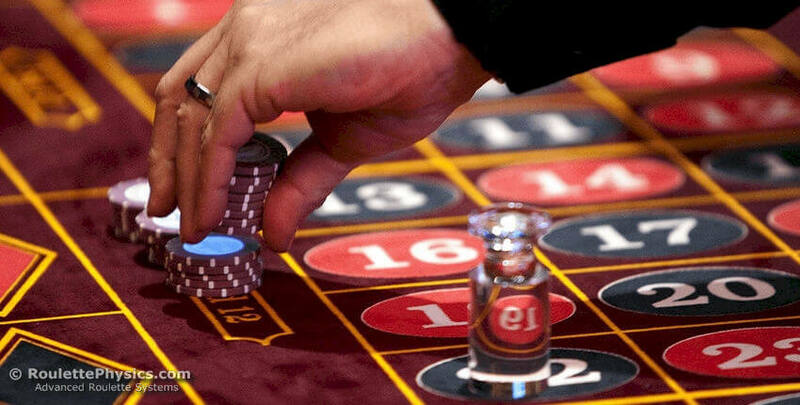 Without the help of automated roulette software, the analysis is virtually impossible. But basically from a roulette player’s perspective, all they need to do is enter the data the software asked for, any analysis is done automatically. The result is the software produces convenient and easy to read betting charts that tell the player when and where to bet. There is of course a little more to it, but that’s the basics of it. Over 1000 players use my system worldwide, which may not seem like a lot, but consider that professional roulette play takes a lot of time and effort to collect the data. This time required is what makes professional systems less appealing. Putting things into perspective, to profit $10,000 with five dollar units may take 2 to 3 weeks, which includes data collection and play. Of course you could bet higher with $25 units and this will greatly compound winnings. Taking it one step further, if you spend 2 to 3 weeks working in a typical job, your profit will be far less. Ultimately the application of my system is very simple from a user’s perspective, with the only significant difficulty being the time it takes. On average, it takes the player approximately one day to fully evaluate a wheel, after which the player can begin to place bets for profit. When you take into consideration the time it takes to earn $10,000 with a typical 9-5 job, it puts the time and effort into perspective. Learn more about my roulette system at www.roulettephysics.com.